A Northampton man who used cash stolen by his mother from her employer to feed his drug and gambling addictions has been jailed. Craig Smith, 36, was sentenced to 10 months when he appeared at Shrewsbury Crown Court last week. He had admitted a charge of acquiring criminal property - around £38,000 - which his mother had paid into his bank accounts. 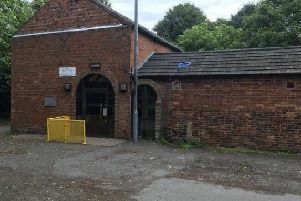 Ann Jones, 58, had falsely listed Smith as an employee of the Shropshire building company where she worked and had transferred the money as 'wages'. The court heard that Smith, of Balfour Close, Northampton, had squandered the cash on his alcohol, drugs and gambling addictions. He had rejected a claim by his mother that he had pressured her into taking the monies from her employer. His lawyer, Adrian Roberts, told the court his client had always held down a job and had shown genuine remorse. He said that while Smith still had an issue with cocaine, his gambling and alcohol issues were now under control. At court last week Jones was jailed for a total of two years and eight months for stealing almost £130,000 while employed as an accounts office manager. Jones, of Heritage Way, Llanymynech, near Oswestry, had admitted taking the monies over a three year period - a third of which she diverted to her son's bank accounts. The court heard Jones had been given a job at Jim Dorricott Construction Ltd of Minsterley, near Shrewsbury, in March 2013. Sati Ruck, prosecuting, said Jones started helping herself to the firm's money just eight weeks after she began working as a bookkeeper and wages clerk. She said that Jones had created a series of false invoices and had transferred £84,000 to a company that was owned by her husband. While the money went into a joint bank account the prosecution said it was accepted that her husband had no knowledge of the fraud. Miss Ruck said that it was also believed Jones had used an estimated £7,300 for withdrawals and personal purchases. In addition, she had transferred £25,000 to the bank account of Craig Smith as 'wages' and a further £13,000 to another of her son's accounts. The fraud came to light in May 2016 when company director Shaun Dorricott spotted the name 'C Smith' on the payroll which he did not recognise. While Jones accepted being responsible for taking the monies she had insisted that she was coerced by her son. Samantha Powis, for Jones, said her client was aware of the seriousness of the offences and apologised for the heartache she had caused the family business. She said Jones had lost her previously exemplary good character and that she had mental health issues. Miss Powis said the fraud was committed due to the "seriously misguided loyalty" that her client had invested in her son, her only child.